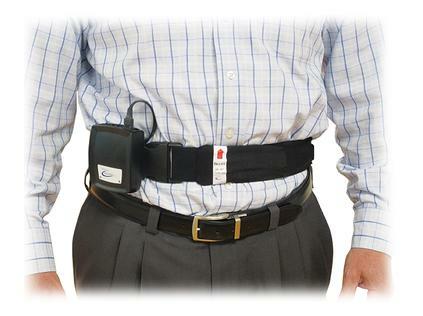 The BioSway is a portable balance system bringing testing and training technology to the patient. This easy transport system is a vital tool for clinicians on-the-go with advanced features such as a new larger display, expanded connectivity, USB ports, Ethernet connectivity, upgradable software, video/audio biofeedback and more. The BioSway is a lightweight instrumented platform with a high-resolution color touchscreen display. The system sets up in minutes to provide patients with a choice of interactive teaching modes or standardized testing environments including the Clinical Test of Sensory Integration of Balance (CTSIB). BioSway provides the necessary reporting for establishing need, progress and outcome. All test results and training sessions can be stored and printed. 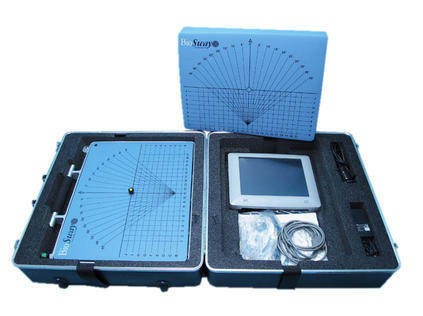 Lightweight Instrumented Platform – sets up in minutes to provide static force testing for interactive training modes or standardized testing environments, including the Clinical Test for Sensory Integration of Balance (CTSIB). Fully Portable – Conveniently portable within a facility for in-resident care. For satellite locations, the optional hardshell travel case provides added protection when transporting to community-based health fairs or school settings for athletics. The case fits easily into small car trunks. Sensory Integration Balance Testing Capabilities – Ability to perform a modified version of the Clinical Test of Sensory Integration of Balance (CTSIB) popular for concussion management. Customize existing CTSIB and BESS test parameters or create and save unique sensory integration protocols. Vibrotactile Feedback – Enhanced biofeedback for Biodex balance technology. Learn more about the VibroTactile System, www.biodex.com/vibrotactile. Display Stands – The BioSway includes a tabletop stand that can also be used to wall mount the display. The display can even attach to compatible display mounts. A telescoping adjustable stand, available separately, is compact and portable with its own travel bag. Who can benefit from the Biodex BioSway? Older adults can be tested for balance deficiencies, and training programs can be established to help them remain mobile or regain their mobility. The portability of the BioSway allows the testing and training to be done either “in-facility” or on location. Note: ICD-10-CM Z91.81 History of Falling includes patients identified as “at risk of falling.” Click here for additional codes that apply. Uses the CTSIB capabilities of the BioSway, clinicians can test patients and compare balance test results to normative data. The clinician uses the BioSway to assess balance and stability of those patients suffering from neurological disorders associated with Parkinson’s, Stroke or Peripheral Neuropathy, and to determine a course of treatment. The progressive testing and training modes are applied to treat and re-train balance and gait. Patients are motivated with real-time biofeedback while their progress can be documented and printed for review. The portable BioSway is an evaluation tool, as well as a rehabilitative device, ideal for patients experiencing vestibular issues. Vestibular therapy includes balance retraining exercises designed to steady a patient while walking or standing through improvements in coordination of muscle responses and organization of sensory information. Coupled with the VibroTactile System patients receive vibrotactile biofeedback resulting in improved postural control – eliminating the need for subjective verbal and hands-on therapist cueing. The BioSway is a valuable tool when addressing balance deficiencies in postsurgical Hip, Knee and Ankle patients, as well as Amputee patients. Balance evaluation, retraining, lower extremity strengthening and weightshift training can speed recovery. The post surgical patients benefit from evolving difficulty of the training modes and the real-time biofeedback. The clinician benefits from ease-of-use, trackable documentation and fast results. Biodex Balance Assessment for Concussion Management delivers objective preseason baseline and postinjury balance assessment for athletes. Detailed summary and progress reports track recovery and provide quantitative data to aid clinicians with return-toplay decisions. All-In-One Flat Panel Display: 15.6" Color Touchscreen, Windows Operating System and Speakers. Video/Audio Out: Bolsters connectivity options to other devices, enabling remote operation for data transfer and software upgrades. Certification: ETL listed to UL 60601-1 and CAN/CSA C22.2 No.:601.1-M90. CE conformity to EN 60601-1, EMC compliance to EN 60601-1-2. Includes: Instrumented platform, CTSIB Indexed Pad, tabletop stand/wall mount bracket, AC adapter for 100-240 V input and two blindfolds. • eLearning Tutorials for increased product utilization. • Marketing Support for Balance Assessment for Concussion Management.